Go Big Read: Are you "prepped"? It's cold and flu season, and your friendly neighborhood Go Big Read blogger took a sick day earlier in the week and spent the afternoon on the couch. Buried under blankets, I ended up catching a few episodes of the show Doomsday Preppers on the National Geographic Channel. These were the scariest years of the Cold War, the height of the McCarthy era, when every stranger was a potential communist and it was assumed that the Soviet Union could be deploying its nuclear weapons at any moment (weapons built, of course, on the foundation of the Curies' research on radiation—though neither of them lived long enough to see where their research had led). At this time, citizens were encouraged by civil defense organizations to build fallout shelters in their homes and to stockpile food, water, gas masks and other resources to help them survive in the event of a nuclear war. 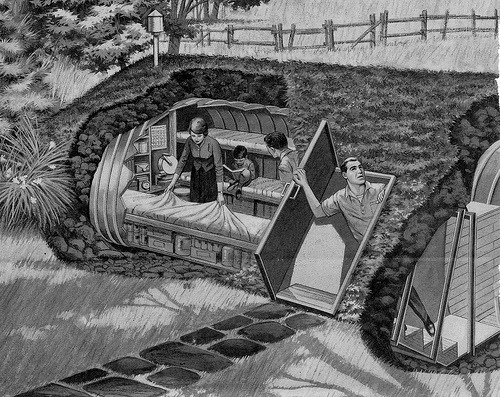 Today's Doomsday Preppers are only following in a long tradition. Though the Communists with their atomic bombs may no longer be the "Big Bad" of our collective cultural imagination, there are other things to fear: global warming, government conspiracies, bioterrorism, a zombie apocalypse, the supposed "2012 prophecies," and more. Certainly, there are things in this world that are frightening, and preparation for certain disasters and emergencies is wise. As Vic Rantala points out, peace of mind is a valuable thing. However, sixty years from now, these prepping extremes might seem as silly and antiquated as Bert the Turtle and his "duck and cover" technique—or maybe the preppers will have the last laugh after all. To learn more about modern-day prepping, head over to the American Preppers Network, and check out their guide to getting started in prepping. Or visit either of these sites for more information. You can also check out Vic Rantala's company, Safecastle, LLC. Proving what everyone feared: the show is still focusing on extreme, sensational stuff - especially anything that includes explosions - and not on basics at all. Great show! Yes-they focus on the crazies prepping for things like a zombie apocalypse, or alien invasion, but the show also brings light on some of the rational reasons for being a prepper. The way they rate preppers in terms of their survival chance may help others realise that they get prepared - even if only for a 72 hour emergency.